Issue: The World Summit on Food Security (Rome, Nov. 16-18 2009) is agriculture’s bid for the attention of climate change negotiators en route to Copenhagen. To carbon traders, agriculture is a money-maker. To food negotiators, it is a billion people hungry with more on the way due to global warming. The food/climate summitry obscures a critical battle over the future governance of global food and agricultural institutions. 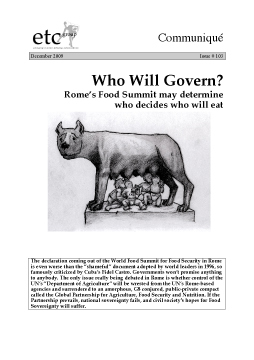 The G8, the UN Secretary-General, and the Romebased food agencies – FAO, WFP (World Food Programme), IFAD (International Fund for Agricultural Development) and the (often overlooked) CGIAR (Consultative Group on International Agricultural Research) – are in a three-way fight for institutional leadership over world food security. The decision about who will decide who will eat is the Summit’s hot topic. Fora: When governments awoke to the food crisis in the second quarter of 2008, two separate initiatives popped onto the scene. First, UN Secretary-General Ban-Ki Moon took advantage of the crisis to create a High-Level Taskforce of 22 UN and Bretton Woods institutions to respond to the challenge and (though unstated) to assert UN headquarters’ hegemony over the interminably squabbling Rome agencies. Then, France’s President Sarkozy (backed by the G-8 and, half-heartedly, by the G-20) proposed a Global Partnership for Agriculture, Food Security and Nutrition; a new vertical fund for agricultural development; and an expert advisory committee to guide agriculture’s future. After a critical meeting in Madrid this January, Rome’s feuding agencies called a temporary truce to stare down the Secretary-General forcing him to let a long-neglected leftover from the 1970s food crisis known as the Committee on World Food Security (CFS) take a crack at uniting the UN System and creating a global body that could meet Sarkozy’s demand for a Global Partnership. Between Madrid and the CFS, the G20 met in Pittsburgh and agreed that a new fund of around $20 billion (over 3 years) should be managed by the World Bank. When the CFS convened in Rome in mid-October, the global South was staring down the barrel of a huge new cash cow in Washington and still-persistent proposals for anamorphous Global Partnership hovering somewhere in the mid-Atlantic. Much to its own surprise and very much to the credit of its Chair, the CFS agreed to a new, more transparent intergovernmental and interagency structure in which it was acknowledged as the policy “hub” around food and agriculture. The euphoria may be short lived. In the draft declaration for the World Food Summit, states subordinate the CFS to the (as yet) undefined Global Partnership. opportunity of the 2011 FAO leadership change to facilitate a new leadership model among the Rome agencies.